There is someone out there with the perfect words to say to you. They are going through - or have already experienced - the same things you're going through. And boy, could you guys support each other. You could talk and talk and talk and become best friends. It's nice to have someone to confide in. Someone who just... knows. These people are hard to come by, but they are around. I suppose that can be answered in the little poem above. Not the good things, of course not the good things. But those are what people need to hear! You are never alone. Ever. Everything that you go through... someone has experienced it before you. Open yourself up. Share what you know. A certain confidence comes with knowing. And it takes a certain person to see what others need and have the courage to share their experiences... to fill that need. So, for the good and happiness of everyone, be that person. Share what you know with others. Observe, then serve. 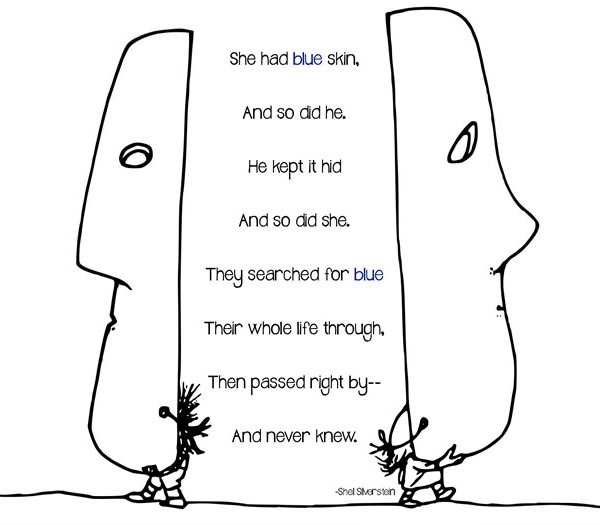 And wear your blue skin out in the open sometimes. Or maybe wear a few less layers on top. You could really bless a lot of lives. Here's to being blue...although I have learned that "it isn't easy being green", either! You know me well enough by now...that I wear my blue openly, (and I'm not referring to my BYU blue here, either). I guess I'm tired of keeping up with a version of myself that doesn't really exist, anyhow! Blue is beautiful. Blue is real. In a very old Primary song, we sing..."Blue is for Courage, to do what is right". That sure parallels with your post. Thanks again for your VERY mature insight!! Love always and all ways...Sister A.
Haha. That comment totally made my day. Hmmm... I guess you are an example of wearing your blue openly! :) Haha... I don't even have a good response.